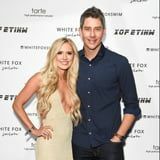 The wedding bells have officially rung for The Bachelor stars Arie Luyendyk Jr. and Lauren Burnham! On Jan. 12, the couple wed in a beautiful ceremony in Maui, surrounded by friends and family , including Bachelor alums Sean Lowe and Catherine Giudici. The ceremony was also officiated by the show's host, Chris Harrison . Arie Luyendyk Jr. and Lauren Burnham tied the knot in Hawaii.